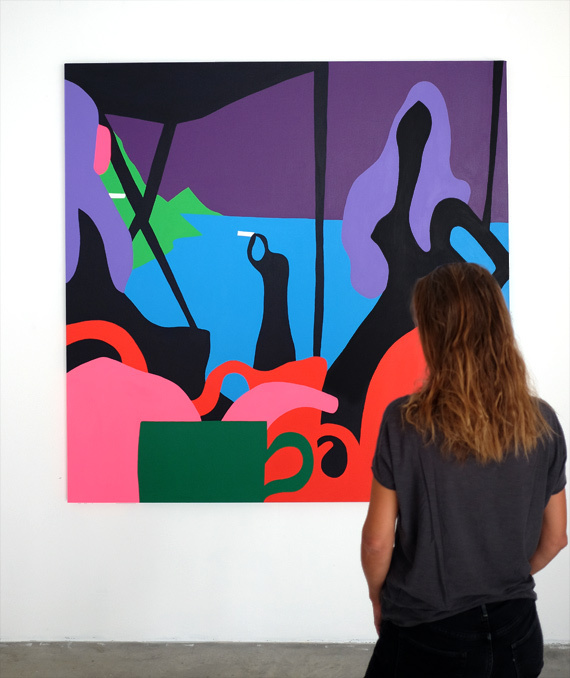 Three years after last showing at the venerated ALICE Gallery in Brussels, New York artist Todd James returns to the premises for a third time. With 'Electric Ritual', opening September 6 2018, James offers a renewed entry pass for the bright, colourful wonder of his artistic universe. To celebrate the occasion, silkscreen prints signed and numbered by the artist will be released in a limited run of 45. Known for his satiric, comic-style artistic portrayals of American war and brightly-hued violence as well as Western tropes of female beauty and fantasy superheroes, Todd James has been interweaving art and commerce for a long time - creating both large and small-scale installations while also collaborating aptly within the music (Mobb Deep, Beastie Boys, Eminem, U2...) and TV (Aqua Teen Hunger Force...) industry. In 2000, James - also known as REAS - created Street Market at New York City’s Deitch Projects with Barry McGee and Steve Powers, cannonballing his career from the graffiti in-circle onwards. Lately his focus has been drawn inwards, portraying colour-block interiors that draw the imagination inwards. The opening vernissage at ALICE Gallery on September 6 is part of Brussels Gallery Weekend, currently in its 11th inception. Art fiends can visit 39 participating galleries, a dozen institutes and art spaces uptown and downtown until September 9. Find the full programme and practical info here.